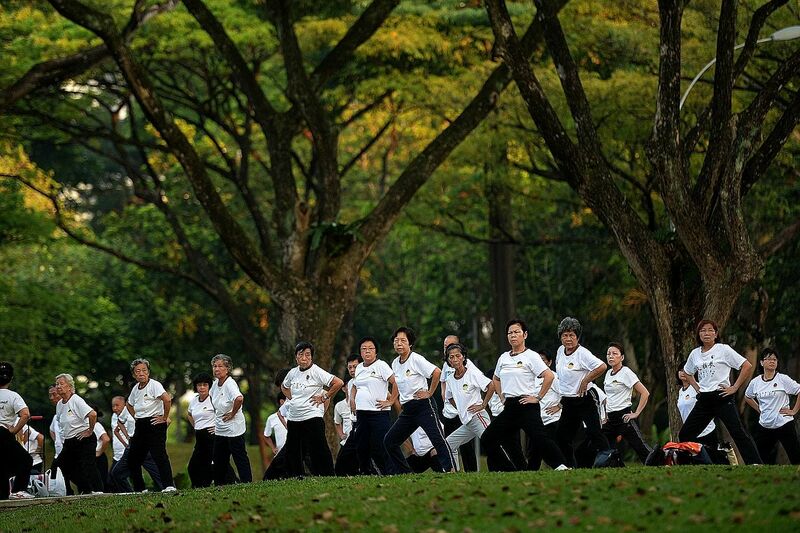 Like almost all developed countries, Singapore is ageing, although few are doing it as well. Numerous factors help to explain whether or not developed countries age successfully: levels and distribution of wealth; health behaviours; access to healthcare; the adequacy of social welfare systems; the strength and support of the family and civil/non-governmental institutions, social stability, to name a few. Government policy affects all these considerations, positively or negatively, and in the case of Singapore there can be little doubt that the Government, on balance, has helped to create conditions that have made it possible for the country's population to "grey" successfully compared to elderly populations elsewhere. It is well known, for example, that life expectancy in Singapore is among the highest in the world. According to the World Health Organisation publication World Health Statistics 2015, for example, Singapore, with a life expectancy of 83 years for men and women, is tied with six others (Andorra, Australia, Italy, San Marino, Spain and Switzerland) for second place in the world just behind Japan, where the life expectancy is slightly higher at 84. Less well known is the fact that Singapore is number one in the world in what may be an even more powerful indicator of successful ageing: Healthy Life Expectancy (HLE). HLE captures in a single measure lifetime morbidity (the frequency of disease, illnesses, disabilities) and mortality data for a given population. With an HLE at birth of 76 in 2013, Singapore pips Japan (75). Only one other nation in the world has an HLE of over 73 - Cyprus (74) - and the world average is 62. It is unlikely, if not impossible, that Singapore's HLE could have been realised without governmental facilitation. The Singapore Government began thinking about the ageing of the country's population in the early 1980s. Since then it has worked assiduously on the implications of the "greying" of Singapore - the median age in Singapore in 2014 was 39.3, up from 34 in 2000 . In so doing, it has revised and in some cases fundamentally recast many policies in order to better adjust to and accommodate the growing numbers and proportions of the elderly in Singapore (11 per cent of the population is now 65 or over). Although it is difficult to capture all such "grey-inflected" policy moves, any shortlist would include the many policy adjustments made over the past 25 or 30 years to the Central Provident Fund, to healthcare and health insurance, to Housing Board regulations, to the age of retirement, and, more controversially, to immigration policy. As Singapore and other developed societies age, and as policymakers around the world shift priorities at least at the margin towards older segments of the population, it is useful to keep in mind that providing more resources for the elderly entails finding and employing new resources or shifting existing resources from someplace else. If the shift affects another or other age groups, it can be seen as an intergenerational resource transfer, whether intentional or unintentional. As societies age, and the strong likelihood of intergenerational transfers grows, it's timely to air an idea associated with the US-based MacArthur Foundation's Research Network on an Ageing Society: the development of systematic impact statements for age-related policies. Such statements are modelled after the environmental impact statements (EIS) required by the US National Environmental Policy Act passed in 1969. An EIS is meant to ensure that an intended action was thoroughly vetted and that a range of voices was heard. The need for a course of action, and its costs and benefits, were to be rigorously justified. Alternative possibilities have to be spelt out, with costs and benefits, compared to the proposed course of action. Obviously, this slows things down, and can be labour- and resource-intensive. The requirement, however, has helped to sharpen and deepen the level of analysis regarding proposed actions; helping at times to avoid large-scale environmental damage; and in increasing transparency and giving greater expression to a range of views. Traditionally, designers of policy proposals affecting one age cohort have not paid close attention to the intergenerational effects of such policies. In recent years, as talk of "intergenerational warfare" has begun to surface in developed countries, the broader effects of age-related policies have received more attention. Thus far, however, such attention has focused mainly on their fiscal implications. What the MacArthur network is recommending is a much broader conceptual approach, analysing intergenerational effects not merely in fiscal terms but also measured according to social, health, quality-of-life, and equity criteria. With respect to policies aimed at the elderly in Singapore: How, for example, would a given change in HDB policy - such as the establishment of the Multi-Generation Priority Scheme - affect HDB residents more generally? What effects (if any) would changes in healthcare such as the Pioneer Generation Package have on healthcare options and delivery for other generations? What in intergenerational terms are the costs and benefits of raising the retirement age and of encouraging or discouraging immigration? And regarding all of these actions, what are or were the opportunity costs? These are just a few of the questions that could be addressed by employing an impact statement for age-related policy proposals. To be sure, the use of this tool would slow down decision-making and add costs to policymaking. But if the process to develop the statement was reasonably open and transparent, and if a variety of constituencies was able to weigh in, it is likely that greater "buy in" and "social resilience" - long a governmental goal - would result. However impressive the Singapore Government has been in tackling the issue of ageing - and its efforts in this regard have been impressive indeed - analysing the broad intergenerational effects and implications of such policies through mandated impact statements might render its efforts better still. •The writer is Albert R. Newsome Distinguished Professor of History and director of the Global Research Institute at the University of North Carolina-Chapel Hill. In 2005, he was Raffles Professor of History at the National University of Singapore.